Towns in New Jersey scrambled to prepare for their first major winter storm not long after Hurricane Sandy destroyed huge swaths of coastline. NBC's Katy Tur reports. Updated at 1 a.m. ET: Snow fell on damaged homes and debris piles in parts of the New York City area as a nor'easter moved in Wednesday, causing new power outages and calls for evacuations. By Wednesday night, the winds had caused more than 100,000 new power outages in the Mid-Atlantic and Northeast, the U.S. Energy Department stated. That brought the total number to 715,000, most of those remaining from Superstorm Sandy, which made landfall in New Jersey on Oct. 29. Throughout the Tri-state area, people wore coats indoors as they endured yet another night without heat. Some of those who had weathered Sandy told NBC New York on Wednesday they were petrified. Alexander's home was spared when Sandy hit, but homes around him burned to the ground, and the boardwalk near his home was washed out to sea. "They said it would be a rough winter," he noted to NBC New York. One local resident refuses to be driven out by the latest storm, a combo of snow and rain that is threatening areas already ravaged by Hurricane Sandy. NBC's Stephanie Gosk reports. About 1,200 flights were canceled across the Northeast, while residents of a few areas hit hardest by Superstorm Sandy last week were urged to evacuate in case of new flooding. Long Island Rail Road service was also suspended before 7 p.m. because of weather-related signal problems, NBC New York reported. A punishing nor'easter is expected to dump snow on storm-battered New York and New Jersey. NBC's Jay Gray reports. New York Mayor Michael Bloomberg directed police to use their patrol car loudspeakers to warn the 20,000 to 30,000 residents in vulnerable areas to evacuate. In Belle Harbor, in Queens, police patrolled the streets, advertising a warming shelter. Officers found that most had left their homes to stay with family, NBC New York reported. In Toms River, N.J., residents of nearby barrier island communities lashed out at the city council because they had not been allowed to return to their homes since before Sandy hit. Said one resident at a city council meeting: "These people need to understand it's our island, it's our home, and we need to defend it like it's a castle." The snow from the latest Nor'easter is expected to continue through midnight before finally winding down in the early hours of Thursday morning. NBC's Janice Huff reports. "One of the bigger concerns ... would be the debris that's been piled up from all the residences and the businesses," Kevin O'Hara, police chief in Point Pleasant, N.J., told The Weather Channel. "With winds picking up to 30-, 40-, 50-mile-per-hour gusts," he added, "our fear is that if people are out and about they could be hit by flying debris. We would urge people to stay in their houses, stay home, and let the storm pass." The Long Island Power Authority dedicated more than 12,000 workers to restoring power to its customers -- 8,000 of those workers were linemen and tree trimming crews from around the country, including some who had been airlifted in by the National Guard. Sea Bright, N.J., is among the areas fearing new flooding on Wednesday. Katy Tur reports. Snow storms are unusual at this time of year in the New York area. Snowfall had never previously been recorded at Islip, N.Y., Kennedy and LaGuardia airports. Central Park recorded 2.8 inches of snowfall, beating the 1878 record of 0.1 inches. Bridgeport, Conn., saw 3.5 inches, breaking the former record of 2.0 inches set in 1953. In Newark, N.J., 2.0 inches fell; trace amounts had been recorded in 1981. 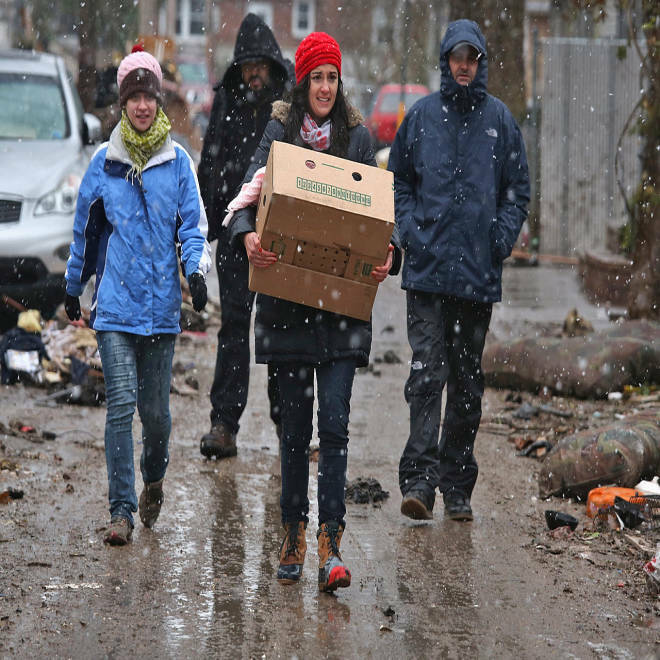 "It's not a massive nor'easter by winter standards," said Weather Channel expert Tom Niziol, "but at this time of year immediately after Sandy's wrath and destruction, this isn't what we want." "Mother Nature is not cutting us a break along the East Coast," he said. As the day cooled into night, The Weather Channel forecast three inches of snow in Philadelphia with wind gusts over 30 mph, a combination of wet snow and wind in New Jersey, and snowfall totals of six to 12 inches in southeastern New York and New England. In New York, Bloomberg expected up to three inches of snow. He said no new flooding occurred along the city's coastal areas "through the first and most dangerous cycle of high tide" on Wednesday afternoon. Bloomberg had ordered three nursing homes and an adult care facility evacuated Tuesday from Queens' vulnerable Rockaway Peninsula. About 620 residents were moved. Fearing winds could down more trees, the city also closed all parks, playgrounds and beaches at noon Wednesday, and ordered all construction sites to be secured. Sandy killed more than 100 people, mainly in New York City and New Jersey, and left more than 8 million homes and businesses without power. 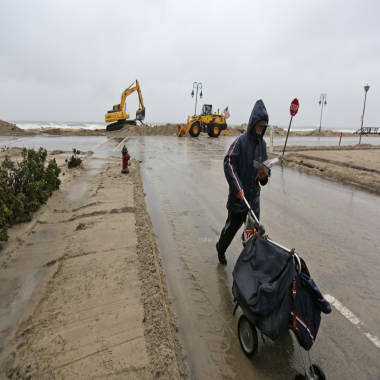 Postal carrier Kenneth Henn delivers mail in the evacuated section of Belmar, N.J., on Tuesday as earth moving machines pile sand along the beach. Fearing looters, Alex Ocasio told The Associated Press that he planned to ride out the latest storm in his first-floor Rockaway apartment — even after seeing cars float by his front door during Sandy. As the water receded during Sandy, men dressed in dark clothes broke down the door and were surprised to find him and other residents inside, he said. "They tried to say they were rescue workers, then took off," he said. He put up a handmade sign — "Have gun. Will shoot U" — outside his apartment and started using a bed frame to barricade the door. He has gas, so he keeps the oven on and boils water to stay warm at night. "It gets a little humid, but it's not bad," he said. "I'm staying. Nothing can be worse than what happened last week." NBC's Isolde Raftery, Reuters and The Associated Press contributed to this report.